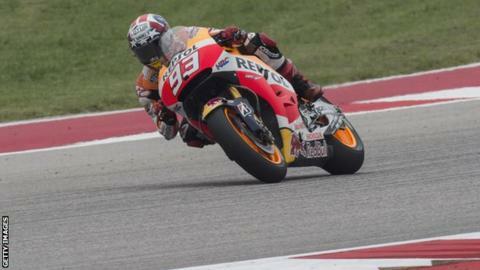 Spanish World Champion Marc Marquez won the Grand Prix of the Americas for the third successive year on Sunday. After a fifth-place finish in the 2015 MotoGP season-opening race in Qatar, the 22-year-old Honda rider finished more than 2.3 seconds ahead of Ducati's Andrea Dovizioso in Texas. Nine-time world champion Valentino Rossi was third on a Yamaha. Danny Kent, Moto3, and Sam Lowes, Moto2, became the first two GB riders to win on the same day since 1977. The last time that happened was in 1977, when Mick Grant, 250cc, and Barry Sheene, 500cc, won their races in Sweden. Leopard Racing's Kent won by over 8.5 seconds from Frenchman Fabio Quartararo, while Lowes held off France's Johann Zarco for his victory.